For this lab, you'll be adding images and even more CSS to further enhance the look of your insider's guide page. The instructions will increasingly become more vague as I expect you to start making good, informed design decisions based on what we've discussed and for you to rely on others' opinions of what is readable. In VS Code, be sure you are on the master branch of your Insider's Guide assignment. Perform a sync in lower left corner by clicking the "two arrows in a circle" button. Then add a new branch called pa3. Set the margin for the body element to zero. Set the margin for all section elements to 8 pixels. 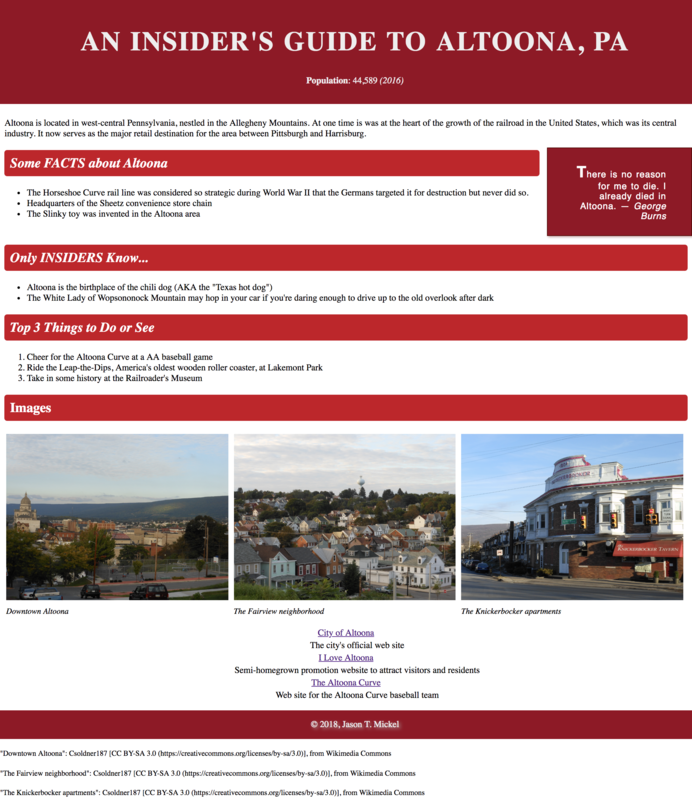 Above the "Top 3 Things" list, add a new sectionthat starts with a header element containing an h2 element with the text "Images"
Select three photographs that depict your city. Optimally, you should be the owner of the photographs; however, you may use any free, royalty-free photos provided that you supply proper citation in both the image's title attribute and at the bottom of the page. Create a new folder called "images" under the main folder where your insiders-yourusername lab is stored. Then drag and drop each image into that folder in VS Code. Alternatively, you can use Windows Explorer or the Mac Finder to move the picture files into your new images folder. Use CSS to set the width and height to allow the three images to fit the page without being too large or small or appearing out of proportion. Wrap each image in a figure element and use figcaption to describe each photo's content. Set the text color to be a light, contrasting color to the background. Add padding to the text to make it readable and spaced comfortably from the text below. Affix it to the top of the screen so it appears even after you start scrolling down the page. Make it stretch the entire width of the browser window with no whitespace on the left, right, or top. Set the correct CSS property on it to guarantee that it is always on top of everything else. Set the top margin of first section following the header to make it completely visible below the header before the user scrolls down the page. Remove the red and green on "Facts" and "Insiders"
Using CSS, make your quotation appear along the right side of the page. Set a specific width on the aside. Add a float property to the aside that causes it to appear to the right of the "Facts" list. Hint: Remember that float requires the element to be moved in the HTML to make it appear in the desired spot, but keeps semantics in mind as you consider where to place it. Be sure that the float only impacts the "Facts" list — nothing below it. Set the bottom margin to 1x the size of the base font. Change the padding so that the top/bottom have the same values, and the left/right have the same values but are different from the top/bottom. You also may need to rethink how you sized your images from earlier. Also, consider the spacing between the figures. Is there anything you can do about that? Using similar CSS code, make your footer look like your header. It should NOT be fixed like the header, though. Commit and sync your code to GitHub. On the GitHub site, create a pull request to merge your pa3 branch into the master branch. Please DO NOT delete the pa3 branch when finished. The lab will begin with a full score of 75 points and deductions will be made according to the amount and severity of errors.